Hey, friends . . . what follows below is something I wrote on the fly the other night and posted to the Facebook page. Occasionally, I’ll write “mini posts” over there so if you haven’t connected with me on Facebook, click here and then click “Like.” Yep, it’s just that easy. Secondly, here’s the scoop on how writers get “paid”: Truthfully, we really don’t until we’ve published four or five books and even then, it’s certainly no windfall. The other way you can “pay” us is to 1) subscribe to the blog if you enjoy it (enter your email address in the box found in the right header), 2) “Like” us on social media sites (all can be found in the top right header – Facebook, Twitter, Pinterest) and take the 2 seconds it takes to share posts you like and 3) buy our books when they are released. Heart Sisters: Being the Friend You Want to Have will be released by Abingdon Press on April 15, 2015. Honestly, I don’t like asking you all to “follow” me because I really just want you to follow Jesus. But the sad reality is . . . publishing houses look at numbers and the bigger the platform (which is this blog here), the better the chance of getting a book contract. Without further ado, allow me to share my “mini-blog” from the Facebook page published Tuesday night. I hope it speaks to you if you are feeling a bit “heavy” these days . . . This morning I had a meltdown while I talked on the phone with my mom because, you know . . . If you’ve been holding-in a meltdown for a while, nothing opens the floodgate of tears like the voice of your mama. After we hung up, I needed to just have some time to cry. For the people of Iraq. For the family of Robin Williams who will never know why. For the families of those who take their own lives leaving behind so many unanswered questions they will never know this side of heaven. For the family member facing cancer surgery and her very young daughter and terrified husband. Sometimes, this world just feels heavy, doesn’t it? And let’s be honest, when sadness hits us like a tidal wave, it’s tempting to run back to bed, throw the covers over our heads, and surrender in defeat. And lets be honest again . . . There are times when my faith is shaky. Times when I have to repeat the truth over and over simply to remind myself of what is real and true. After Cry Fest 2014, I went up to take a shower – which is my own private confessional where I can lament and be angry and say whatever I want to say to God. I did just that. It’s OK to feel heavy because you feel sadness for another person’s suffering – that’s called compassion. 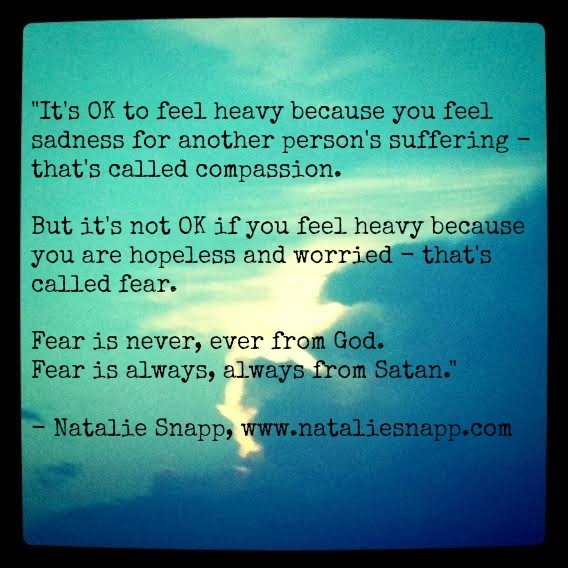 But it’s not OK if you feel heavy because you are hopeless and worried – that’s called fear. Fear is never, ever from God. Fear is always, always from Satan. So if you are feeling the same heaviness I’m feeling, might I remind you again of the scripture God gave me this morning? Just thought I would remind you of what you’re made of tonight, friends.